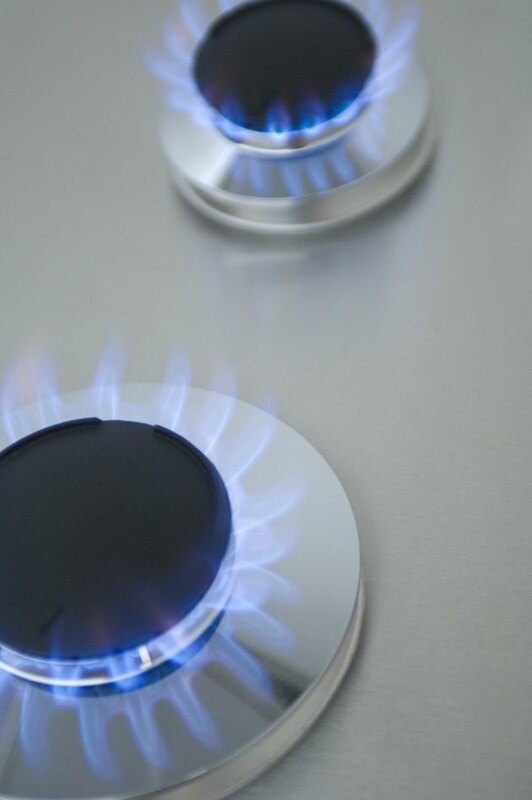 Natural gas and propane are both gas fuels widely used in cooking and heating. In most of the world, natural gas is distributed through a centralized pipeline network (local, national and even international), while propane is almost always sold in tanks of various sizes. Both propane and natural gas are highly efficient cooking fuels, and stoves can be readily adjusted to use either one. Natural gas consists primarily of methane and sometimes includes small quantities of propane, butane and other gases, usually prior to refining. Natural gas is transported to homes and buildings by underground utility pipelines, and remains in a gaseous state from its production all the way to the stovetop or furnace. The only exception occurs on liquefied natural gas (LNG) tanker vessels, which use extremely cold temperatures and high pressures to transport natural gas as a liquid. Propane is often found with or near natural gas. Propane is a distillate of petroleum and is sometimes referred to as liquefied petroleum gas (LPG). Unlike natural gas, propane is readily storable as a liquid at room temperature so long as it is kept under pressure. This makes it highly transportable and available in a variety of tank sizes, ranging from handheld to building-size. Propane's mass-distribution model is less advanced than that of natural gas. Propane pipelines generally serve only industrial sites, with most residents picking up propane by the tank or getting refills by truck. Natural gas stoves and ovens are located mainly indoors as central appliances in residential kitchens, and are also popular at restaurants. Such stoves often include digital controls and timers. They receive gas from the pipeline utility system. Most propane stoves are built for outdoor use, whether as grills or portable cook stoves. Recently, however, mainstream appliance manufacturers like Electrolux and Fisher & Paykel have been producing indoor propane ranges and stovetops, sometimes including advanced digital controls like their natural gas counterparts. These stoves function essentially identically to natural gas indoor ranges, but receive their fuel from outdoor propane tanks. Because natural gas and propane burn with similar properties, and because propane is in gaseous form from the time it exits the tank, the two types of stoves are sometimes able to utilize the others fuel after a conversion process. Tanked propane typically enters a stove at about twice the pressure of pipe-delivered natural gas, so the conversion process sets the stove to properly manage the pressure of its new fuel. This is done by replacing and adjusting a piece called the orifice, and making adjustments on each burner. Before doing a conversion, you must first verify with the manufacturer or a technician that your stove model can safely use the other fuel. Both natural gas and propane stoves can produce carbon monoxide (CO) fumes, and all indoor stoves need to be checked regularly by a professional. Propane stoves have been frequent causes of CO poisoning when used indoors or in poorly ventilated areas.